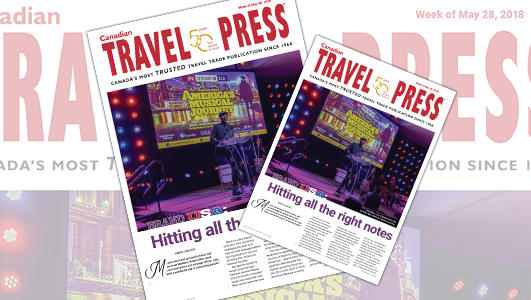 Music is a key theme of Brand USA’s marketing strategies this year and next and the message behind the organization’s second 3D IMAX film, America’s Musical Journey, writes assistant editor, Greg Coates in this week’s digital edition of Canadian Travel Press. Narrated by Academy Award winner Morgan Freeman, the film follows Grammy Award-nominated singer and songwriter Aloe Blacc as he traces the roots of America’s music and follows the footsteps of Louis Armstrong through the colourful locales and cultures where America’s music was born. The new movie is expected to repeat the success of National Parks Adventure – Brand USA’s first giant film that became the highest-grossing documentary film in the world in 2016. America’s Musical Journey will roll out internationally in more than 14 markets – including Canada (Ontario Science Centre) – with the goal on increasing visitation to the US. Madison was in Toronto recently for a special Brand USA event – tied in with Canadian Music Week – in which travel trade personnel got a sneak peek of the film. US partners – and popular musical destinations – on hand for the event, held at the Sheraton Centre Hotel, included Austin, Chicago, Portland, North Carolina, Georgia and Myrtle Beach. Attendees were also treated to a reception and performance by Blacc. For the full story, check out this week’s digital edition of Canadian Travel Press.